The child of Hmong immigrants from Laos, Blia Yang never imagined that college could be a part of her life. But now, she is the director of undergraduate admissions at UC Santa Cruz. She may very well be the first Hmong admissions director in the state—or at least the UC system. 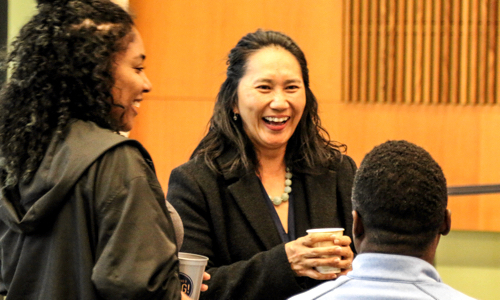 As admissions director, Yang helps lead the campus in recruiting, admitting, and enrolling the next generation of Banana Slugs. Yang and her family left Laos in the aftermath of the Vietnam War for fear of their safety. After landing first in a refugee camp in Thailand, they were resettled in Oklahoma in 1980 when Yang was 4. That state wasn’t a good fit and after a couple of years, the family joined relatives in Fresno. Her parents tried their hand at farming strawberries, zucchini, and tomatoes but weren’t able to compete with big agribusinesses or keep up with the rules and regulations. They also tried with other families to run a convenience store serving the Hmong community. Eventually, the family grew to nine children (Yang is the second to the oldest). They depended on government assistance in the form of cash aid or food stamps since neither parent spoke English or had transferable skills they could use in the U.S. Because of health problems, her father became disabled and the family lived on government assistance. With her parents’ encouragement, Yang worked hard at school and was put in the Gifted and Talented Education program. One day in a junior high, a teacher told her she should think about going to college. But she signed up for Advanced Placement courses and paid attention when her peers talked about college. She started learning about what it took to get in to a university. “I was pretty singularly focused,” she said. When she looked around her own community, she could see a pathway marked for women and a pathway marked for men. Women were expected to get married young and have children right away and live a life of service to family. Men were encouraged to build a career. While she wasn’t against any of those choices, she thought she should have the same options as men. A teacher in high school organized a college tour for her and several students, helping them fund-raise and then renting a car to take them to the different campuses. Yang decided she wanted to go to UC Santa Barbara—but that was going to come as a shock to her family. While her parents wanted her to go to college—they assumed she would attend somewhere local like Fresno City College or California State University, Fresno. They never thought she would enroll in a college four hours away. Yang applied on her own, not involving her parents at all and waited until the last minute to tell them where she planned to attend. The news did not go over well. Her parents flat out forbade her to attend. But Yang wasn’t having it. “I was so stubborn and committed, I said ‘I’m telling you I’m going and that’s that,’” she said. She moved into the dorms with a friend without any assistance from her family. Her departure was full of angry feelings but over time, things lightened up and her family came around. Yang went on to get a master’s degree in guidance and counseling from California Lutheran University and in philosophy from UC Santa Barbara. She joined UC Santa Cruz as associate director of admissions in 2013. She is married and has two children, ages 4 and 2. Her experiences have given her compassion for other students facing the same challenges in becoming first-generation college students.